Paragraph 9c of the Dienstinstruction: see HJSGMK, 10. Facsimiles were kindly supplied by Michael Bosworth who also drew my attention to the online facsimile of the handbill. 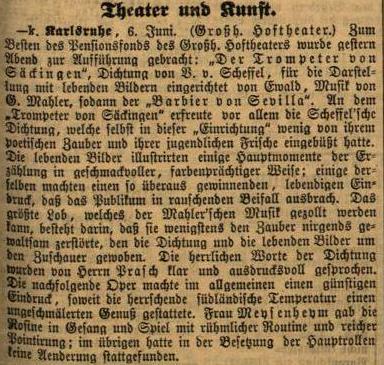 Schaefer (HJSGMK) gives the date of the Wiesbaden performance as 6 June 1885, the day after the performance in Karlsruhe. If that was so, there must have been two sets of performance material. In an early, lost score of the Symphony ([Weberms]), the movement was headed or titled 'In glücklicher Stunde' (WM1995, 199). 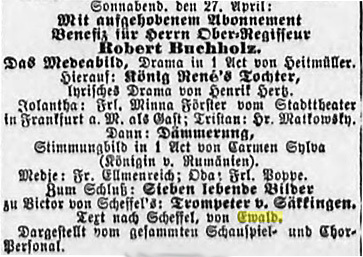 Mahler's contract at the Königliches Theater, Kassel included a clause that required him to provide such music as was requested by the management¹ and in June 1884 he was drawn into the preparations for a benefit concert ‘zum Besten der Allgemeinen Pensions-Anstalt der Genossenschaft Deutscher Bühnenangehörigen’. He was already a member of this international association (membership number 8198), and was also on the committee of the theatre's benefit funds for members of the orchestra and chorus respectively (AGDB, passim). I am very glad to give my consent to a performance of Der Tompeter von Säkkingen in the form of tableaux vivants at the Royal Theatre at Kassel. This was successfully done by the Mining Association during the Carnival at Stuttgart a few years ago, and the linking narration, decorations costumes and the final festive procession of all the participants were highly effective. 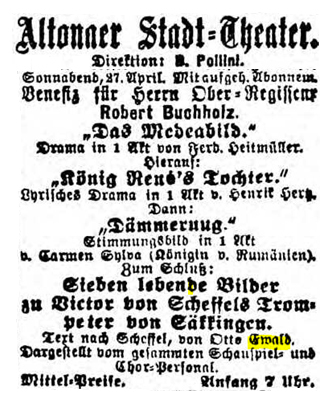 The author of the connecting text was a local Kassel writer, Wilhelm Bennecke (1846–1906) – who may have been related to Frau Bennecke, one of the principal dancers at the theatre – and the narration was spoken by Gustav Thies, a popular leading actor in the company. Ich habe in den letzten Tagen über Hals und Kopf eine Musik zum „Trompeter von Säkkingen“ schreiben müssen, welche morgen mit lebenden Bildern im Theater aufgeführt wird. Binnen 2 Tagen war das Opus fertig und ich muß gestehen, daß ich eine große Freude daran habe. Wie Du Dir denken kannst, hat es nicht viel mit Scheffelscher Affektiertheit gemein, sondern geht eben weit über den Dichter hinaus. Deinen Brief erhielt ich eben, als ich die letzte Note in die Partitur schrieb; wie Du wohl fühlen wirst, schien er mir mehr eine himmlische als irdische Stimme. In the last few days I have had to write some music helter-skelter for Der Trompeter von Säkkingen which is going to be performed in the theatre tomorrow with tableaux vivants. I polished off this opus inside two days, and I must confess I am very pleased with it. As you can imagine, it has little in common with Scheffel's affectation, indeed leaves that author a long way behind. Your letter arrived just as I was writing the last note in the score; as you can imagine, it was more like a heavenly than an earthly voice. Die lebenden Bilder zu Scheffels, „Trompeter von Säkkingen“, zu welchem Herr Musikdirektor Mahler eine durchaus stimmungsvolle Musik componirt hatte, gelangen vortrefflich und wurden stürmisch beklatscht. The tableaux vivants on Scheffel's Trompeter von Säkkingen, for which music director Mahler had composed music full of thoroughly genuine feeling, succeeded splendidly and were enthusiastically applauded. Presumably the 2177 Mk. paid over to the Genossenschaft in September 1884 (see AGDB, 169) were the profits from the evening. Meine „Trompetermusik" ist in Mannheim aufgeführt morden und wird demnächst in Wiesbaden und Karlsruhe aufgeführt werden. Alles natürlich ohne das geringste Zutun von meiner Seite. Denn Du weißt, wie wenig mich gerade dieses Werk in Anspruch nimmt. My `Trumpeter music' has been performed in Mannheim and is shortly to be performed in Wiesbaden and Karlsruhe. All of course without any instigation whatsoever on my part. For you know how little this work in particular concerns me. 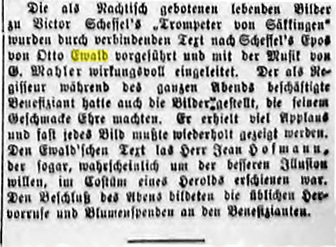 Advertisements for the Wiesbaden performance mentioned by Mahler have not yet been located (though, see GMSL, 392 and GMiK, 51³), and its status remains in doubt, but the research of Michael Bosworth has recently revealed that there was at least one further performance, at a benefit evening for Robert Buchholtz at the Stadttheater in Altona, in April 1889. Otto Ewald was again involved in the production, though in Altona he was credited with the linking texts, adapted from Scheffel. It is no doubt a measure of the popularity of the poem that this occasional work should have had an afterlife, and presumably the effectiveness of Mahler's music had also been noted in theatrical circles, though this in itself provides no clue to how exactly it came to be chosen for performance in Altona. The melody corresponds quite closely to that of Blumine (the last pitch is presumably a misprint for a''), though the chromatic neighbour notes in the accompaniment to the first complete bar do not appear in the symphonic movement, which is a tone lower, in C major.